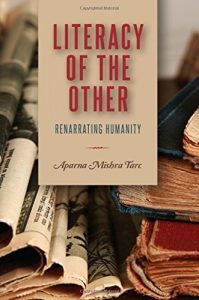 Professor Aparna Mishra Tarc was awarded the prestigious 2017 AERA Division B Outstanding Book Award for her book Literacy of the Other at the recent 2017 AERA Annual Meeting in San Antonio, TX. The award was presented at the AERA Division B Business Meeting, Still We Rise on the evening of April 28th. Literacy of the Other explores a bold psychoanalytical investigation into the existential significance of literacy. Featuring a dazzling array of novel artifacts and events, the book situates literacy in the internal fictive worlds of the self and other. This approach is designed to encourage teachers of language and literature to sustain reflexive thought in their practices of reading and writing as a means to gain insight into the physical processes of literacy. In addition to receiving the award, Mishra Tarc also participated in a book signing and presented several sessions at the 2017 AERA Annual Meeting.